For foreigners here looking for a chance to experience Buddhist culture, the Korean Buddhist Cultural Foundation is running “Templestay Weeks for Foreigners” from Nov. 5-30. Korean Buddhist temples are known to be peaceful and quiet, as most of them are located in mountainous regions. Templestay programs offer participants a glimpse into Buddhist temple life. 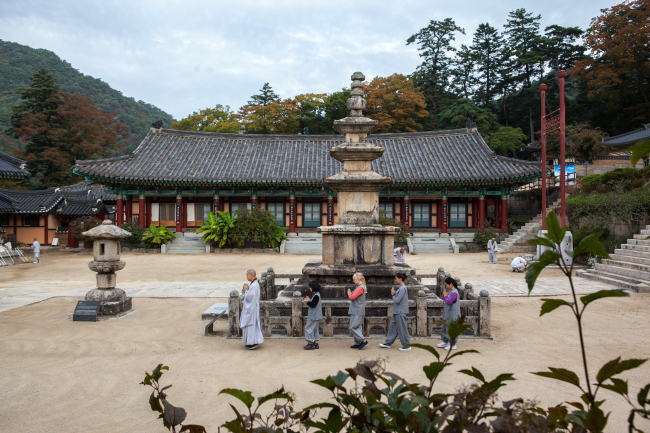 During the promotional period, 39 temples across Korea –- including Bongeunsa in Seoul, Magoksa in South Chungcheong Province, Tongdosa in North Gyeongsang Province, and Daeheungsa in South Jeolla Province -- offer templestay programs at a discounted price. A one-day program, typically including a tea ceremony with a monk for two to three hours or a workshop making a lotus-flowers lantern, is offered at 10,000 won. An overnight stay program costs 20,000 won. The program is divided into two categories. Experience-oriented templestay is filled with arts and crafts sessions and diverse activities, such as chamseon (Zen meditation), 108 bae (bowing) or a workshop making 108 beads for prayer. Relaxation-oriented templestay, on the other hand, allows the participats unstructured time, finding peace for the mind and the body, except for the yebul (chanting ceremony) and gongyang (eating a monastic meal) sessions. According to the foundation, around 70,000 foreign visitors participated in templestay programs last year. “While foreigners’ templestay participation has been on the increase, we prepared the ‘Templestay Weeks for Foreigners,’ as a chance for foreigners living here to experience the country‘s traditional culture,” the foundation’s head monk Wonkyung, who is in charge of running the program, said. English service is offered at most temples on the list, and some run Japanese, Chinese or French services during the period with the help of volunteers. For the schedules and programs, visit the English website at eng.templestay.com or call the information center at (02) 2031-2000.